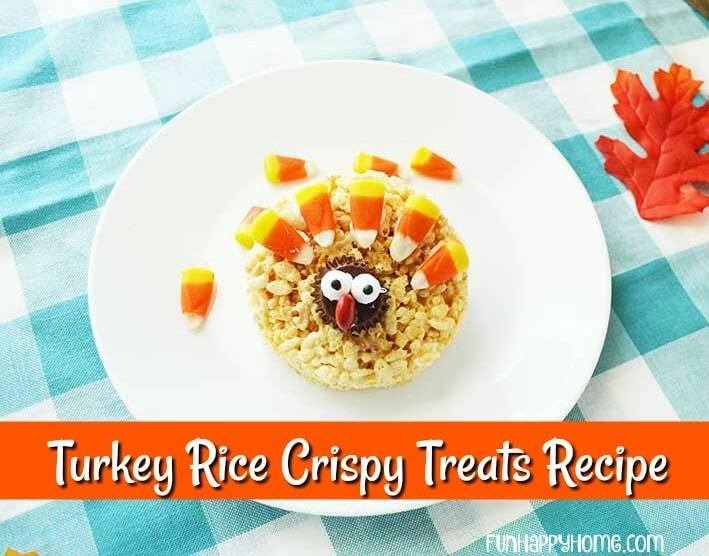 If you’re looking for a Thanksgiving treat that will wow your guests whether they be little or big, you’ll want to make these adorable Turkey Rice Crispy Treats. 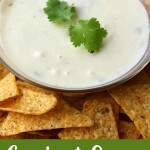 They’re easy to make and oh-so-fun! I love to create fun holiday treats, but I usually don’t have a ton of time. I constantly try to think of fun things I can make that will wow the kids but that won’t take a ton of time to make! 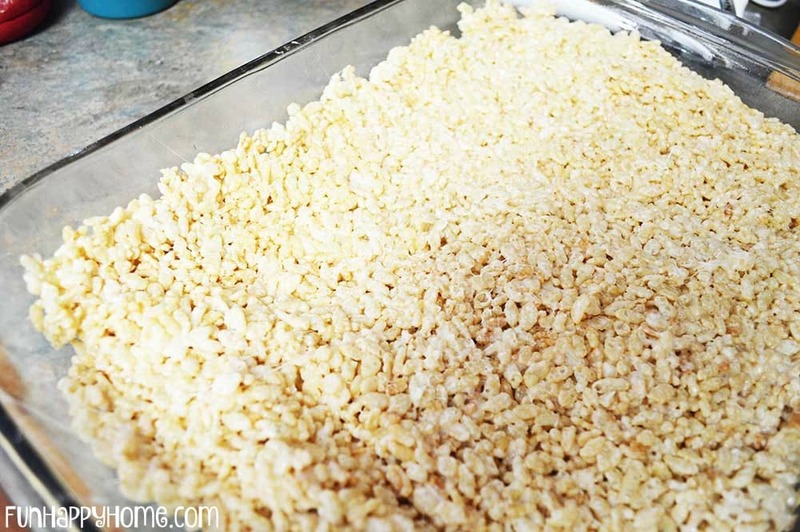 These Turkey Rice Crispy Treats fit the bill perfectly! 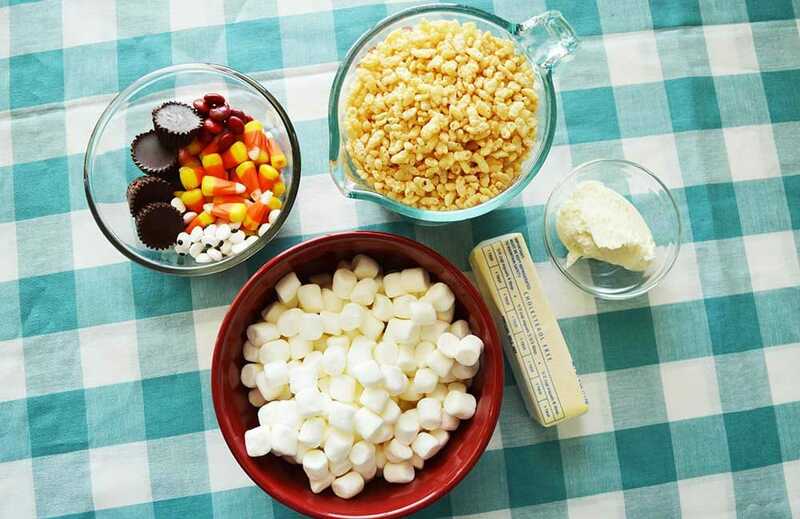 You don’t need many ingredients to make these delightful Thanksgiving treats. 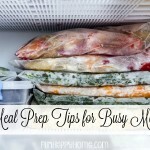 Chances are you have some of these things on hand already. 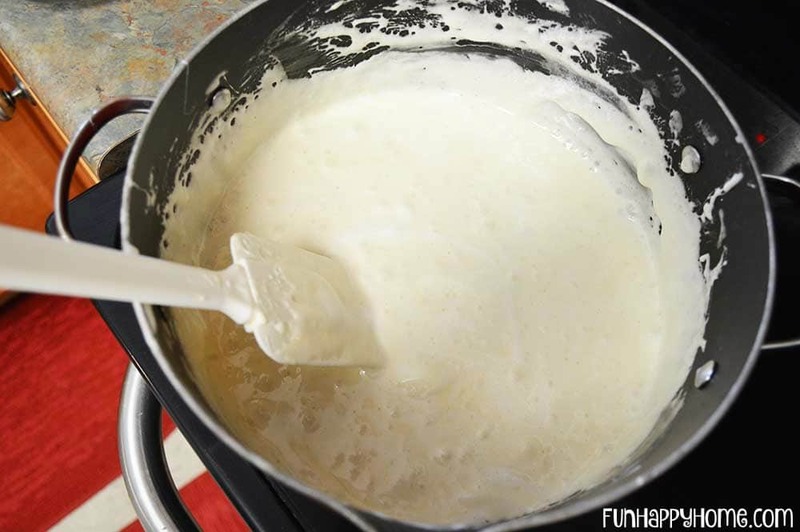 2 Tablespoons Frosting– any variety. Now that you’ve got your ingredients together, here are the directions! Spray a large, 9 x 13 pan with cooking spray. 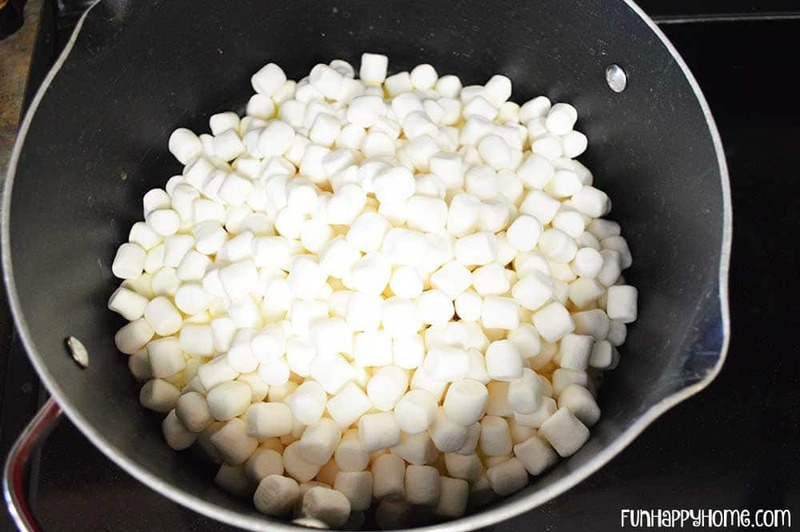 Stir frequently until the marshmallows are melted. Stir in 6 cups cereal, until well combined. 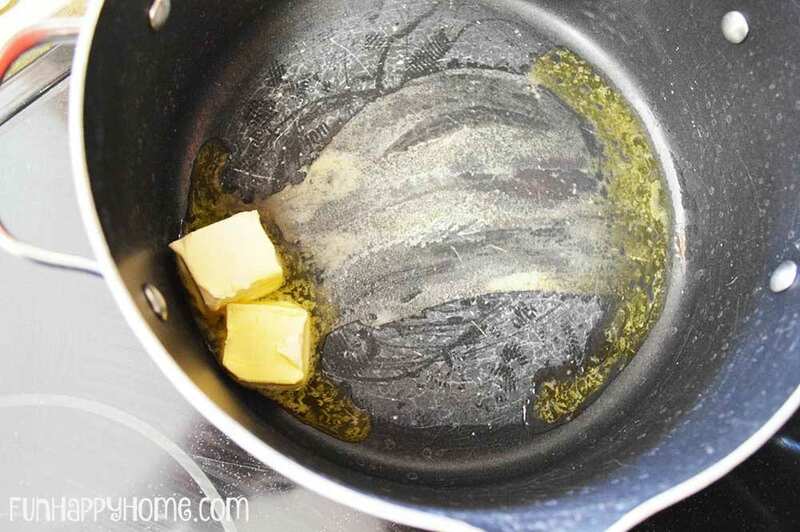 Dump mixture into pan and using parchment paper, press mixture down evenly. Using a cup or other circular item, cut circles out of cooled treats, be sure to re-shape and keep cutting out circles until you’ve used all of the mixture. This makes probably 8-10 turkeys, depending on the circle size. To assemble your turkey, use a small amount of icing on the back of your candies- the peanut butter cup for the body, candy eyes, red candy for the turkey gobbler or beak, and candy corn for feathers. VOILA! You have yourself a fabulous Thanksgiving treat that will wow guests both young and old! 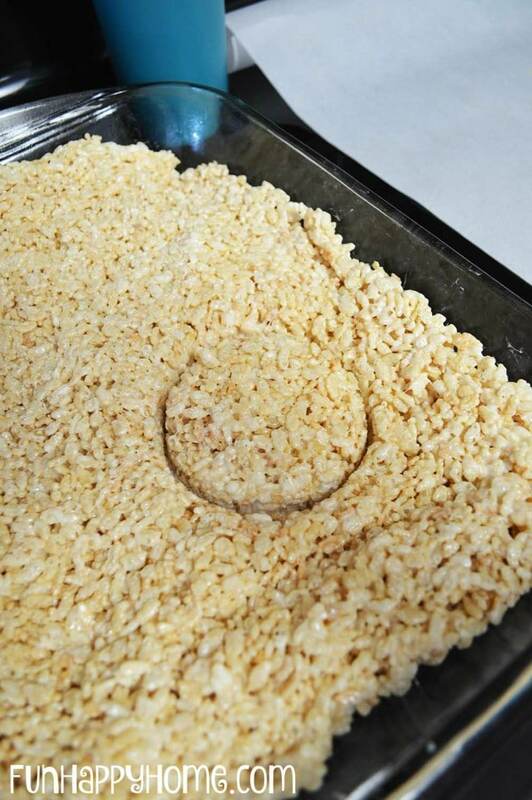 That is such a cute idea for Rice Krispies Treats! I love to make holiday themed treats like this, so I can’t wait to make these! How cute are these? 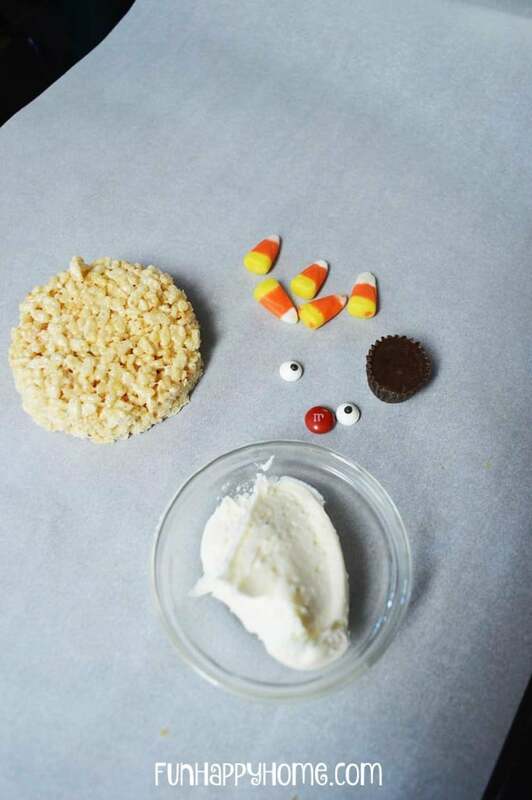 What a fun dessert idea for the kids this Thanksgiving. So cute and so easy! We are always looking for fun ideas to do and I think for sure this is going to be one of them. 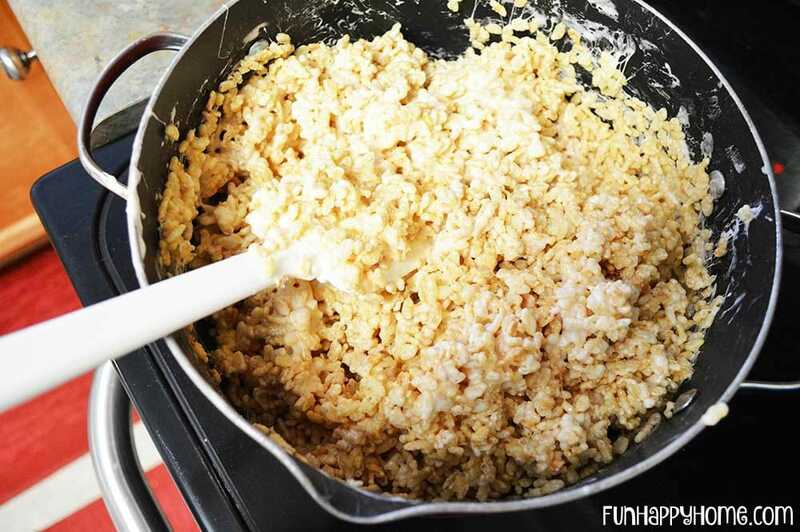 I can ot resist rice crispy treats and that is one of the reasons i don’t make them. The turkey treats are a great idea and very cute, the kids will love them. These are such a cute idea for the fall/thanksgiving! I am going to have to make some of these. They are so creative. What a cute idea for a treat! I am sure that the kids would “gobble” them up. These are so adorable! I need to remember to buy candy corn b/c it is so hard to find after halloween! Can’t believe it’s time to think about TURKEY! This is a fun treat and my son would love to make this with me! This is such a cute idea. And ah I can’t believe Thanksgiving is almost here! These turkey rice treats are mega cute! I know my kids would love them if I made a batch too! I love this! Such a great idea. I love making things like these. My kids have so much fun with them too. Completely adorable! I might make those for the kids’ table … they’d make super cute place cards! Now this is a fun Fall idea. I love the cute peanut butter cup faces! These should be fun to make! We love to make Rice Krispies treats and these are so cute. I am going to have to make them with the kids. My kids would love to make these, but I don’t think they would make it to dessert. These are so cute! My kids LOVE festive desserts- I know these will be a hit on Thanksgiving! These treats look so delicious and easy to make. They are sure to be a hit at this years Halloween party. 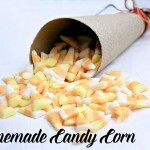 That is such a cute, clever edible craft to make with candy corn with kids. Bet those would be equally fun for the kids at Halloween and Thanksgiving. That’s a cute treat! 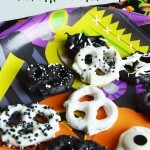 Can be added to my Halloween treat recipes! This is such a cute treat. I’m sure the kids will love making them and eating them. This is such a cute idea for Thanksgiving! I bet our kids would go nuts over this! These are so cute! What a fun holiday treat!